Hi Sean , when you say you don’t think ts doing a good enough job of baking the logs ,can i ask what size are the logs you are throwing in ? and do you have any insulation around the outside of the drum or is just uncovered ? There are effective ways to handle barrels. At least on a few gallons scale, combustion is halted almost immediately after the lid is pushed on, and the temp then begins to drop. I suspect small batches are effectively out in minutes. I can’t extrapolate from my experience to barrel scale, but I suspect 12 hours indicates ongoing combustion. It is uninsulated. The stuff thicker then about 3", to be run twice. 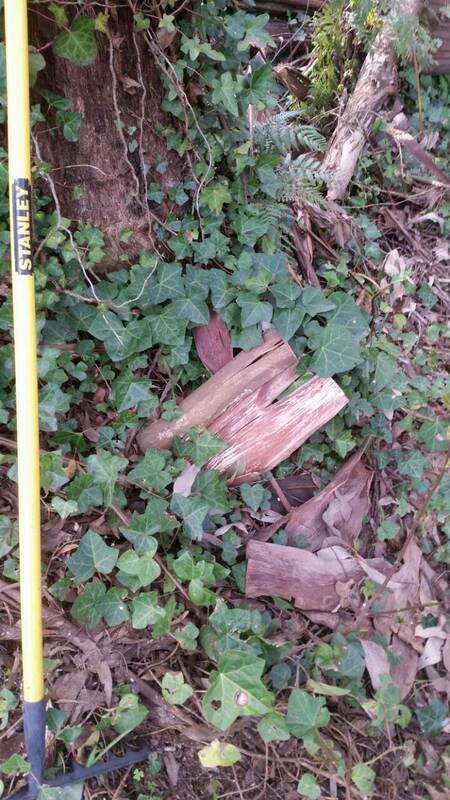 but I threw in some 10-12" pieces of elm that maybe charred an inch, and under that it wasn’t dark at all. To be a bit fair, it probably wasn’t that dry, and on top of it was mostly brush from like honeysuckle or chokecherry. You are probably getting the shared wisdom from the comments above, but I will add my two cents worth. A little insulation helps a lot, even if it is just another layer of metal with air between. 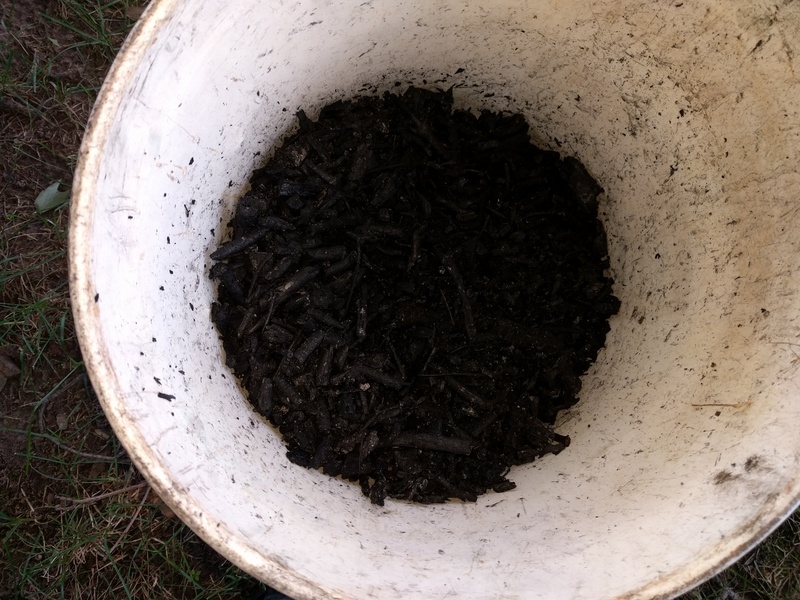 An inch or so of wood ash works well. My habit is to cool my 55 gallon batches overnight, but 4 hours is usually plenty. Yes, insulation lengthens cool down time. Keep feed stock dimeter < 2’’ when possible. 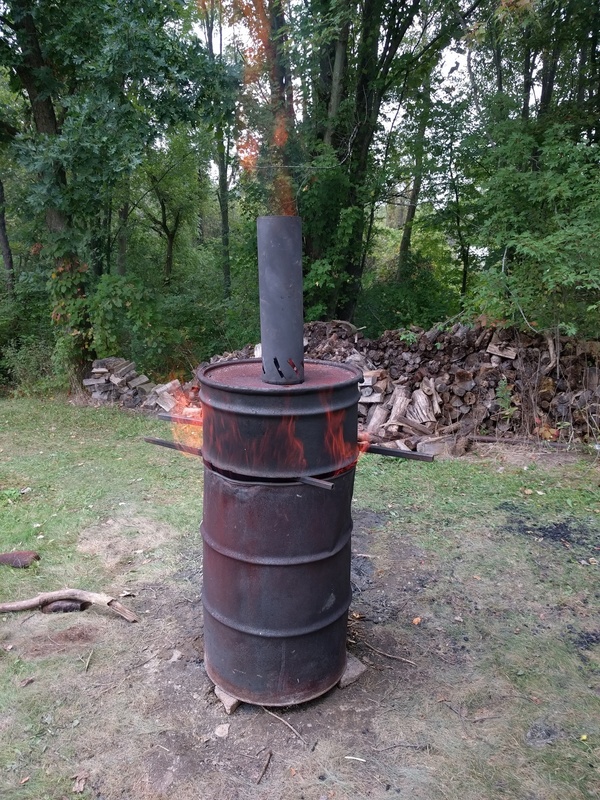 For what its worth, I have made nearly a ton of char in 30 and 55 gallon drums without quenching and without getting burned. I can’t quite visualize your setup from the description. A sketch would let us be more helpful. Using a blower to get things started can significantly shorten startup times. Consider a retort instead of an open kiln/ TLUD. Route gases down to the bottom so the heat of combustion is added to your barrel instead of just going up in smoke. After 52 days of over 100 F, we got 2 weeks of light rain and I’m back to making charcoal. During the drought and burn ban, I got some new barrels and punched 5/8" holes around the bottom after removing the tops. I set these two barrels side-by-side and lit them both at the same time, without the steel roofing liners. (See my Posts 91 & 109) It was hectic trying to build a good char bed on top of the wood in the two barrels, plus the paint was burning off of the barrels, so there was a bit of smoke now and then. The next load was with one barrel, with new liners. PERFECT! No smoke at all. With the liners, there is no need for any square tube or rebar spacers, because the tops of the liners are not even. In any TLUD, it is very important to build a good bed of char on top of the load. A pyrolyzing front then moves down through the fuel, converting it to charcoal as it goes. The glowing charcoal on top burns off any smoke coming from below. Use a good stack of twigs and branches (or paper balls, cardboard strips, etc.) to establish that char bed on top. My next load will be the 312th 55 gallon drum of wood converted to charcoal. With all the hot weather I have no problem getting dry charcoal. I dump the barrels into a pile in the yard, and cover it with screen to keep the dogs and cats from digging/crapping in it. It is transferred to the first screening/shaking rack with a big scoop shovel. Then to the grinder, and back to the screening rack, all done in the hot sun. I am way behind on the processing of the charcoal. Using the roofing liners works extremely well, and I’m beginning to think that air travels downward between the barrel and the liner, even after the bottom holes are covered with sand. Very easy to start burning char at the end, so it has to be watched, else you end up with too much ash and a reduced output of charcoal. Most loads are done in less than 90 minutes. Nothing pays dividends like experience! Ray, Your serendipitous liner mod is ingenious. If a blower (I use a hair dryer with a variable speed controller) is available, it is easier to establish this pyrolytic front on top. Punch holes in the bottom of the barrel and set it over a dug out area, then use the blower to send air up through the load. With the speed control you can set the appropriate air supply for startup and to create the optimum clean burn. The consistency of the feed stock also affects the progression of the pyrolytic front. If a blower (I use a hair dryer with a variable speed controller) is available, it is easier to establish this pyrolytic front on top. Punch holes in the bottom of the barrel and set it over a dug out area, then use the blower to send air up through the load. There are holes in the bottom of a barrel. It is getting a draft to get started from the chimney effect. It starts right up with a piece of newspaper, and maybe a cup of used motor oil drizzled lightly over the top. If there is uneveness it is usually because the material isn’t consistent, which I know is a problem, but that is a lot more work. I think it actually works a lot like the Sheet Kiln. It takes about 1.5 hours to burn down. The yield isn’t that great, but I could easily be letting it run too long, and there are a lot of small twigs in these batches so it is harder to tell. I am dumping a 5 gallon bucket of water on it to put it out, stirring it slightly to get under areas that didn’t get drenched and then putting the cover on it and letting it sit for about 15 minutes. I think the excessive steam helps put it out as well. The advantage is I can dump it out and reload immediately. Right at this moment it is about speed. I need to free up some space. 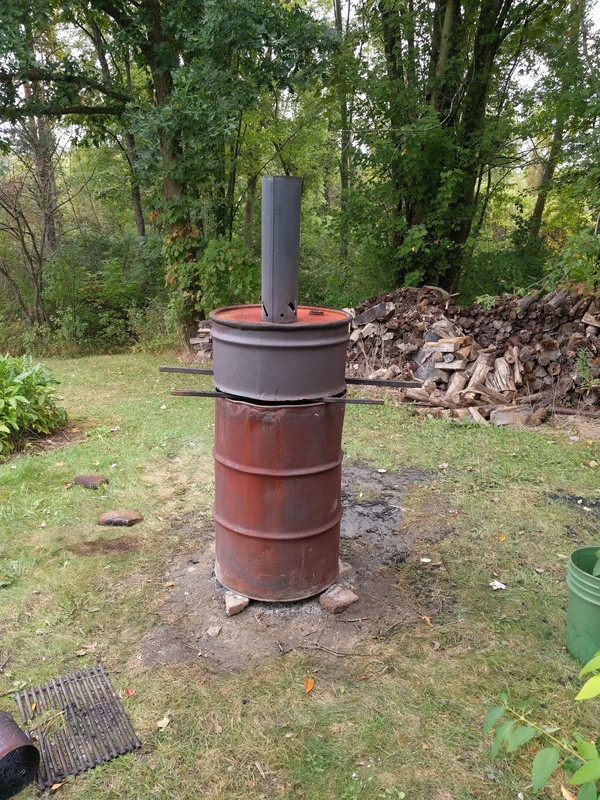 I can probably dry out the charcoal by just dumping it into a 55 gallon drum with a pipe out the top and slits on the bottom. It gets wood nice and dry. I will get a picture here shortly. Here is the retort not running. I will try to get one while it is running later. 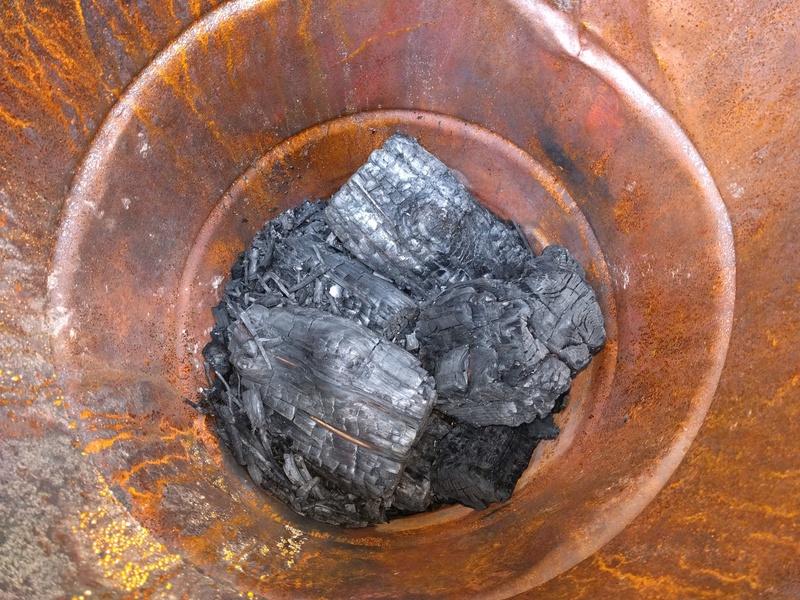 Inside of the barrel after the burn (you can see a white streak where it isn’t charred at all on the bottom left chunk.) Plus you can’t see the slits cut into the chimney pipe. What ended up in the bucket from a previous run. Retort burning you can kind of see waFts of smoke, it gets worse but it is coming out the sides. That’s the yield from a barrel batch? Approximately 2 gallons? Ideal conversion should be close to 40%. I believe your TLUD process is suffering from markedly different fuel sizes and types / densities. All the small fuel is being burnt trying to cook sticks of firewood. TLUDs like even size fuel pieces. Previously you mentioned uncooked elm. Elm is a notoriously wet wood, and quite dense. Elm is also miserable stuff to split unless frozen. It does look pretty sweet. I bet if you add secondary air at the bottom of the big pipe. it will self-light and wont smoke as much. I believe your TLUD process is suffering from markedly different fuel sizes and types / densities. I agree. It also isn’t packed in that tight. 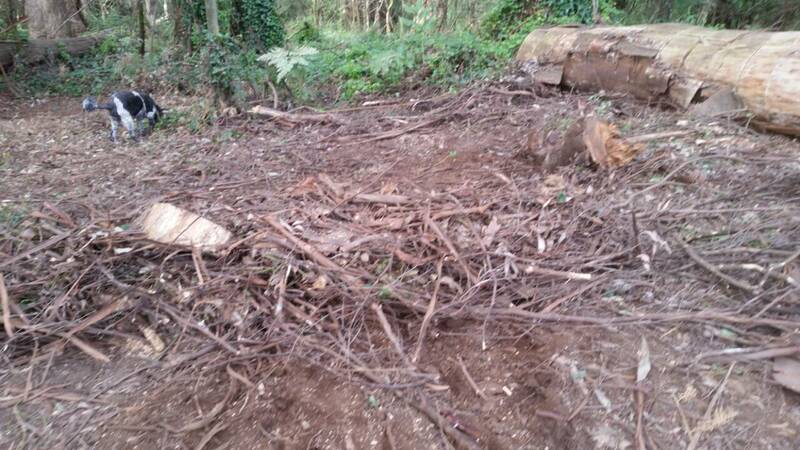 However, I want to get rid of this brush pile. I have more to put on it, and if you don’t move it around viney stuff likes it. So I am willing to sacrifice yield. Elm is also miserable stuff to split unless frozen. Thus it is going into the tlud. It was partially split, but I gave up. You wouod likely be further ahead in that case to just loose pile the elm in the open, and light the pile. At least that way it will be burning even size material, roast at the same rate, and the heat will be more intense to get the job done. Not to mention just getting the pile reduced and done with. I get a 2 - 3 gallon yield from a 5 gallon TLUD. You wouod likely be further ahead in that case to just loose pile the elm in the open, and light the pile. Probably, however, you need a permit and such to do that. I am most likely letting it run too long. I’m getting about 4 gallons, which isn’t much for sure. The second run was terrible. About smoke. I suspect it wasnt getting enough airflow through the bottom, which makes the fan suggestion sound good. Hi Sean , once your charcoal is ready rather than pour water on it , tip the barrel over and shovel the hot coals traight into another drum and place the lid on and they will cool down real fast in no time , its how i do my charcoal i take from my indoor fire . I have been making charcoal outside for the past few weeks , trying to clean up our bush before the burn bans come into effect this summer . i live in the coldest wettest part of Victoria Australia , half way up a mountain and on a very steep slope . I normally make all the charcoal i need for running a generator from my indoor slow combustion fire , and i can sometimes make as much as 50 litres a day if i have the time to take out all the charcoal before refilling my fire every hour or so with hardwood pallet wood , nearly every piece i put in i can get get out as charcoal , nails and the end plates i take out with magnets before shredding to size . so making charcoal from branches ect has always been hard work for me and untill now has always seemed a waste of good heating wood to make charcoal as i only burn indoors the branches and trunks that i split when i want a lazy day without constant feeding of pallet wood . So this is how i now clean up my property by burning all the bark ,twigs and leaf rubbish that constantly falls from our tree’s ( mountain ash ) the messiest tallest tree’s around . 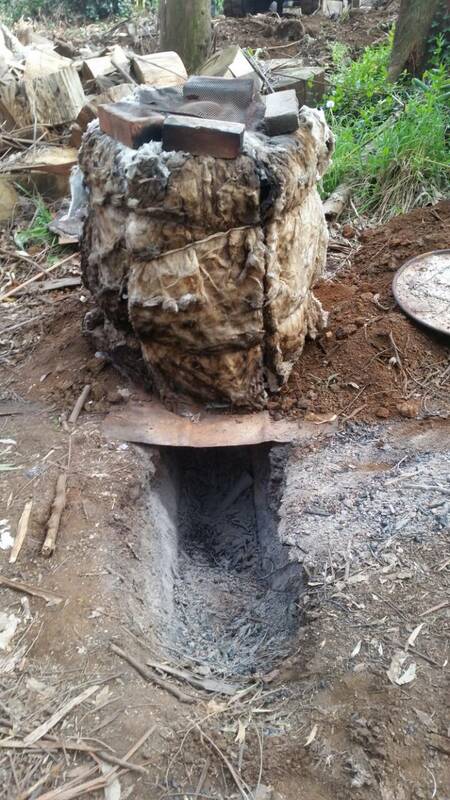 I have dug a deep hole about 3 foot deep under the barrel that has a 6 inch stove pipe running through it and insulation around the sides and top , with a 1 inch pipe also inside from the top of the barrel to the bottom to help get the gases out and back below . i fill the barrel up with all the smaller branches that i cut up on a drop saw running off my charcoal generator and solar panels , i try and keep the size of the branches to around 2 inch in dia and about 3 or 4 inches long any that are a bigger dia i keep for the indoor fire . 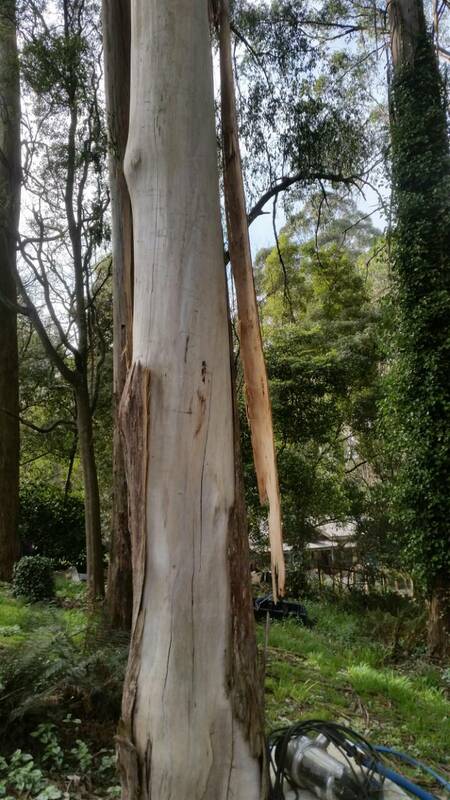 Just a few bad quality photo’s so you get the idea , see how the bark hangs off the tree’s and you get an idea how messy my place gets every day of the year as i have about 30 of these tree’s within a 100 ft of my house . 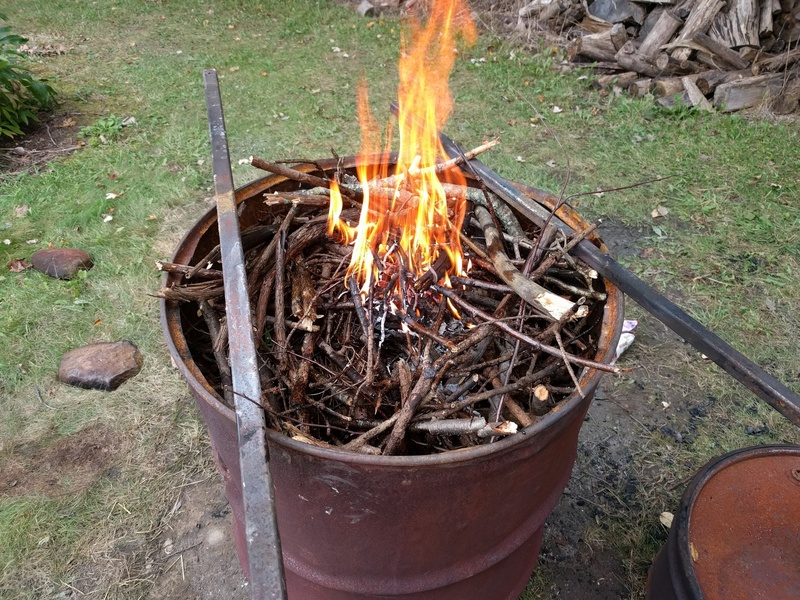 When the fire is out below the barrel and just embers left i can shovel those out as well and get about 75 litres of ash and small charcoal but there is a lot of earth thats fallen in so i am letting it all burn away to ash till i can get a sieve with 10 mm holes to seperate it . Hey Sean, I also played around with top lit updraft, but ran into many of the problems you are having with smoke and uneven sized feedstocks. 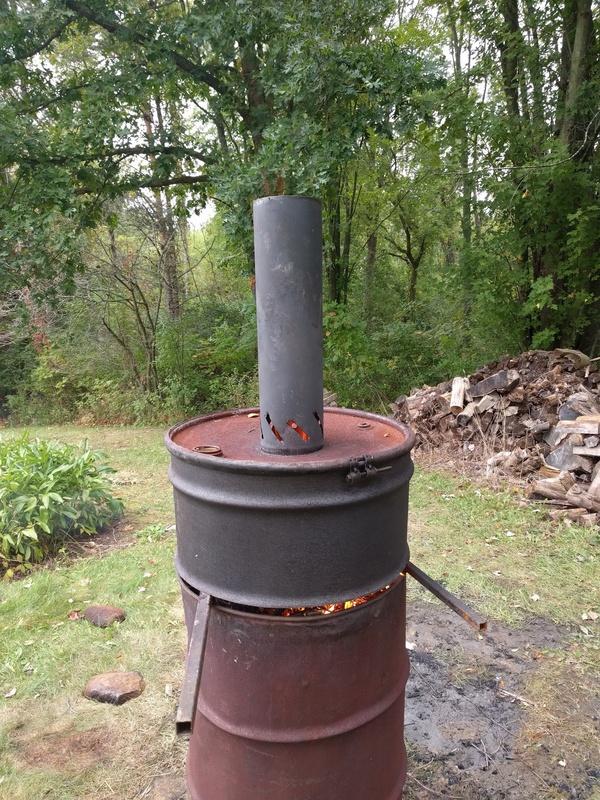 I had really good luck with just burning wood in a barrel, using it as a simple pyramid kiln. You can look at my post #214 to see my final design, but really i suspect it would work just fine with a plain old steel drum. I am going to set up several of these this year and just shovel in scraps as fast as they will burn them. i am letting it all burn away to ash till i can get a sieve with 10 mm holes to seperate it . I just use hardware cloth, set on top of a wheelbarrow to get the ash out. Then you can shake it and roll it so it flows into a bucket at the other end. Are you flipping the barrel upseide down after filling it, or do you just have a removeable lid? 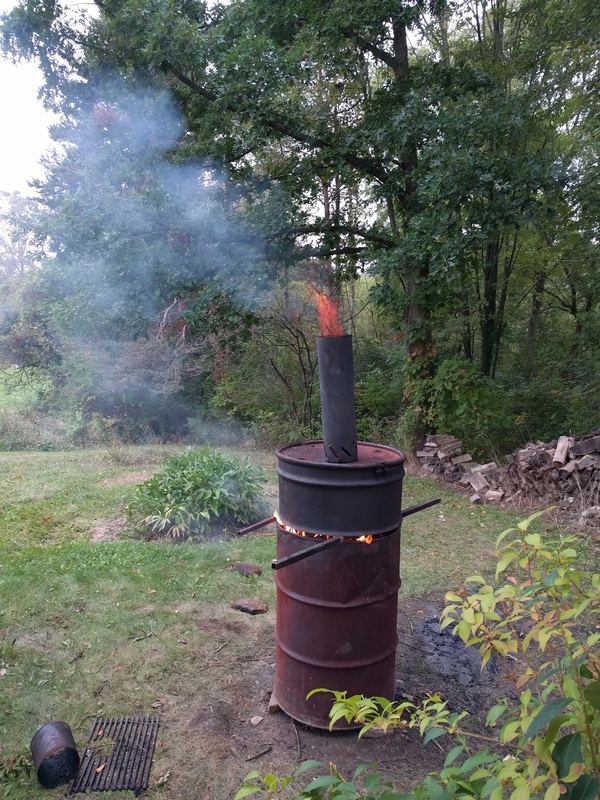 I had really good luck with just burning wood in a barrel, using it as a simple pyramid kiln. I thought about that, but it requires more constant attention, and there are some fire requlations. Plus I haul the barrel to the brush pile to fill it up. It is easier then hauling the brush to the barrel.